Reviews of "Freckles and the Less Fortunate"
Freckles the bunny wants everything she sees in the stores until one day, she meets another bunny named Stew and learns just how lucky she is to have what she does. Stew's family can't afford to buy everything new or shop very often. Freckles soon begins to think of ways to help her new friend. Join Freckles and her friends in another funny story for you and your child to enjoy. Children will learn just how lucky they are to have what they do and get a better understanding of those that don't. Boots the kitten, who loves to groom; Tiger the puppy, who loves to play and act like a Tiger; Norma the fawn, who is shy and can run fast; Dreamy the chick, who loves to nap; Donut the duckling, who loves circles; and Freckles, the lesson learner of the books, are all back for their second book in the series. * Appreciate what you have. * Not everyone is as fortunate as others. * Donate what you no longer use or need. SOFTCOVER: 28 color illustrations. 8.5 x 8.5" size. Ages Pre-K/Kindergarten and up. 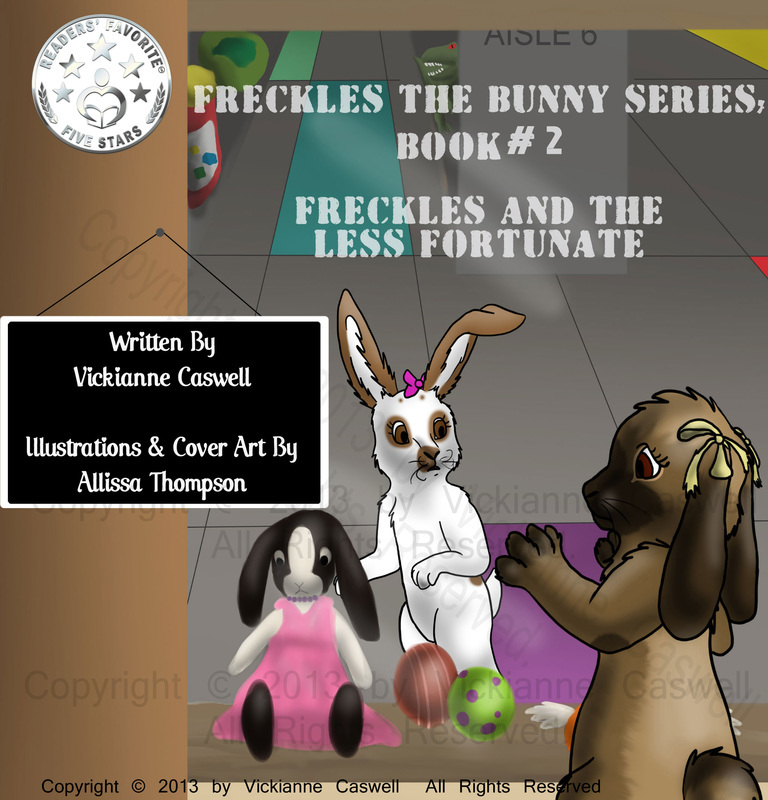 Freckles and the Less Fortunate (Freckles the Bunny Series) (Volume 2) is written by Vickianne Caswell. This book is a children's book about animals. The design and layout of the book enables a child to follow along with the story using the beautifully colored and vibrant illustrations. The plot is a powerful story that is both educational and inspirational, providing a life lesson of giving to those who are less fortunate. The book conveys a heart warming message of a young girl bunny who learns how to not be so selfish and that giving to those who are less fortunate can be just as fulfilling as getting new things, when a new student enters her school and doesn't have all the special things the other students take for granted. Vickianne Caswell did a superb job on her book Freckles and the Less Fortunate. I enjoyed reading this book. At the end of the story the author provides a behind-the-story section, a fun facts section, and an activity. I loved that the book told more about the characters. Most young readers want to know about the characters in the stories they are reading. The fun facts section makes the story more creative and entertaining. The activity allows for a themes art project after a story session, a great addition to a child's day. This book, with its life lesson, review section and activity is a great book for all parents and teachers to read, use, and enjoy. - 7 year old girl. - 8 year old boy. This book is well written and presents children with the issues of children that are less fortunate. Freckles is a young rabbit who is a typical youngster, wanting everything she sees. Her mother begins to teach her of other people who are not as prosperous as she is, by giving money and food to a local charity. Later in the book, Freckles befriends a new girl in class that she eventually finds out is not as well off as she and her family. She begins to see that giving is more blessed than receiving. This book is a great educational tool for young people. It is wonderfully illustrated with bright colors, that will capture the attention of younger children, while teaching them one of life's valuable lessons. I recommend this book and the entire series as they are educational and fun. The heartwarming story of how Freckles learns to give and share with those that are not as comfortable as her own family. Like most kids, Freckles wants everything she sees when she goes shopping with her mum and doesn't understand why she can't have what she asks for. It isn't until a new classmate arrives that barely has enough food for lunch or toys of her own to play with that Freckles realizes how lucky she really is. What an absolutely adorable story! FRECKLES AND THE LESS FORTUNATE is the second in a continuing series of children’s picture books by author Vickianne Caswell. The star of the series is a young bunny named Freckles and in this story she learns a lesson in sharing with another young rabbit, whose family doesn't always have enough. Freckles becomes friends with Stew and learns to share and not want everything she sees. It's a lesson many kids today should be learning.